Taking a personal injury claim to court can be very tricky. In many cases, people without prior legal training cannot properly evaluate what to do in most situations involving personal injury claims and personal injury insurance. Few understand the actual process of making a personal injury claim after a car accident or negotiating a bodily injury claim. That is why personal injury lawyers exist, as they help their clients guide personal injury lawsuits through the court system and insurance settlement process. 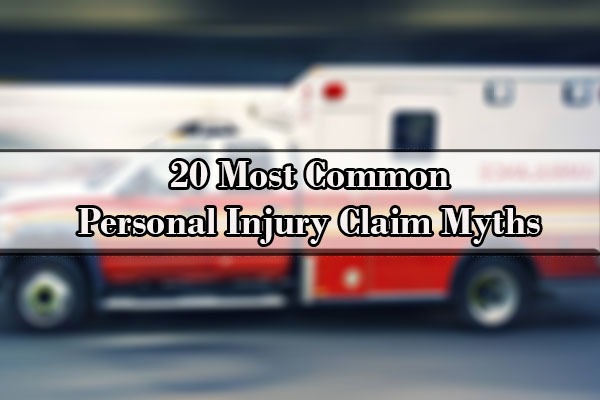 Additionally, many myths about personal injury lawsuits continue to persist. The purpose of this article is to diffuse those myths and educate people on the misconceptions that they have about suing for personal injury and receiving personal injury claim payouts. Yes you do, but even if you do not need to, you should. On the one hand, you may either not realize that you have a case or you have a better case than you thought. On the other hand, you may think you have a case, but the matter is not worth pursuing. Either way, it is important to seek out a legal opinion so that you at least have additional information about your situation. In fact, many consultations with personal injuries are free. For example, the Law Office of Yuriy Moshes provides free, no-strings attached consultation services for its personal injury clients. Simply because two lawyers both graduated from law school does not mean that their skill sets are identical. Just as in other fields, there are different types of legal specialties. For example, in the medical field, no patient wants their stomach to be operated on by a brain surgeon or vice versa. The same is true in law. While you may have a family lawyer that you trust, that family lawyer is not necessarily the proper specialty to litigate your personal injury claim. If you know and trust a lawyer who does not practice personal injury law, do not ask that lawyer to take your injury case. Instead, you should ask that lawyer for a referral to a personal injury lawyer he/she knows can do the job right. If the first part of the statement were always true, then this would not be a myth. However, what many people believe are “minor injuries” are not necessarily minor. In many cases, minor injuries can become worse over time. Additionally, some injuries lie dormant and do not even present themselves until months after an injury occurs. If you have been injured, seek medical attention immediately so that you can understand the extent of your injuries and the likelihood that “minor injuries” will become worse over time. Not necessarily. Filing a lawsuit does not guarantee you to compensation. For example, if Adam files a lawsuit against Bob even though Bob did nothing at all to hurt Adam, then Adam does not get to receive “compensation” simply because he filed a lawsuit. The Plaintiff must prove that a legal reason exists for receiving compensation. Many victims can work with an attorney to negotiate an insurance settlement rather than filing a lawsuit. In many cases, insurance settlements may be preferable because they can be resolved more quickly than by going to court. This is not generally true for two reasons. 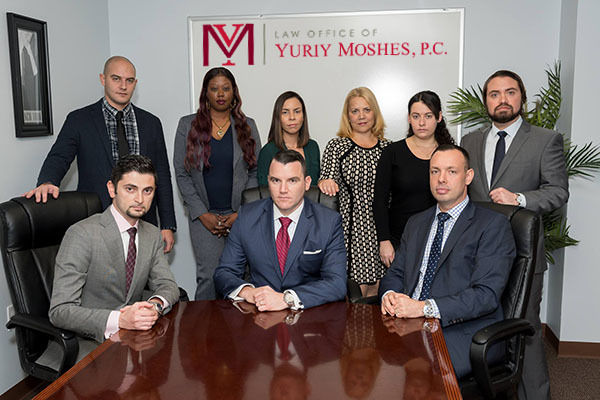 First, while some attorneys charge a fee for consultation services, some personal injury attorneys, such as the Law Office of Yuriy Moshes, provide free consultations to accident injury victims. Second, personal injury attorneys do not necessarily cost a lot of money to hire. This is because many personal injury attorneys take cases on a contingency-fee basis, which means that any fees are taken out of the final verdict or settlement rather than being paid up front. Not necessarily. Not every injury can result in a personal injury lawsuit, and in some cases, not all losses may be compensated by going to court. This occurs most commonly where a jury does not believe the injury victim or a judge dismisses a claim early for failing to conform to legal technicalities. Unfortunately, nothing is guaranteed in the law. Even successful claims will occasionally not result in a full recovery. This is particularly true in cases where an injured party attempts to negotiate with an insurance company without attorney representation. Generally, hiring a personal injury lawyer can increase your chances of receiving full compensation from the at-fault party. Just like the principle of double jeopardy prevents a criminal from being tried in court twice for committing the same crime, the legal rule of res judicata prevents personal injury victims from trying to seek compensation for their injuries more than once. This is partially true. As a general rule, an employer can fire an employee for just about any reason. This is the rule known as “at will” employment. Your employment is not protected in every single circumstance. For example, if you and your employer get into a car accident on your day off and you sue your employer, your employer can legally fire you. Generally, this is not the case. While we would love to tell you that hiring an attorney is like winning the lottery, it is important to be realistic about what a personal injury lawsuit is and what it is not. Large multi-million dollar verdicts do happen but they are not typical in most cases. What a personal injury claim will do is help you receive compensation for your injury in the form of reimbursement of your medical bills, lost wages, and pain and suffering. Unfortunately, the law places deadlines on the filing of personal injury lawsuits. All states have a law known as the “statute of limitations” which limits how long people can wait before filing a lawsuit. New York’s statute of limitations is three years from the date of the accident. If New York state, its cities or municipalities are the cause of your injuries, you must file a notice of claim within 90 days of the date of accident. Regardless of the time limit applicable in your state, you should begin strategizing with a personal injury attorney immediately to give both you and your attorney plenty of time to plan out the best way to file a claim. Definitely not true. In fact, this myth puts the cart before the horse. In a personal injury lawsuit, the injured party is suing for damages. As part of this damages award, the injured party can seek compensation for any unpaid or outstanding medical bills that resulted from treating the injury. Most people misunderstand the term “frivolous lawsuit.” A frivolous lawsuit is a legal term with a specific definition. Frivolous lawsuits are legal claims without any basis in either law or fact. As a matter of law, a personal injury claim is absolutely a valid legal claim and is by definition not frivolous. The facts will differ from case to case, however, and in some cases, bringing a lawsuit may be frivolous. For example, if Adam sues Bob for personal injury after a car accident, but Adam was actually in a car accident with Steve, not Bob, then Adam has probably filed a frivolous lawsuit. Outside of these types of outlandish scenarios, however, most personal injury lawsuits are not frivolous. Generally, this is not true. Your insurance company will normally cover the cost of medical bills. Depending on the type of insurance policy and its limits, your insurance company may cover the cost of property damage minus the deductible amount. In any case where you are injured, however, you must seek recovery from the at-fault individual’s insurance company for pain and suffering and similiar damages, which will require you to hire an attorney. This myth is half-true. Your insurance contract specifies the extent to which your insurance company must protect you. Generally, this protection is limited to instances where you are being sued by someone else. If you are injured and have to file a lawsuit, however, your insurance company is under no obligation to either fight for your rights or hire an attorney for you. In fact, insurance companies generally tend to prey on injury victims who are not represented by an attorney and offer minimal compensation wherever possible. The truth of this myth will vary from lawsuit to lawsuit. It is true that some lawsuits drag on for years; however, this long timeline is only typical for extremely complex personal injury lawsuits such as medical malpractice or class action claims. Most car accident claims or other personal injury claims are resolved within a one to three years. For more in depth information, you can read our “How long does my personal injury lawsuit take?” article. This myth flies in the face of legal ethics. Attorneys do not view client information as a commodity that can be bought or sold. In fact, the opposite is true. The Rules of Professional Responsibility for lawyers ban attorneys from sharing ANY client info including personal or financial information with third parties. If an attorney shares or sells your personal, private information with others, the attorney can (and should) lose his or her bar license. Under New York’s no-fault insurance regulations, regardless of fault, the vehicle’s insurance policy that you were a driver or passenger in, is responsible to cover the medical bills up to the limit of the policy. Fault does not determine whose insurance policy pays for medical bills in New York. Many people have various beliefs on the morality of the legal system, and if you have a genuine moral problem with filing a lawsuit, we cannot force you to change your mind. However, most who hold this belief are unfamiliar with the morality underpinning the personal injury recovery system. Personal injury law was actually established for moral reasons. The purpose of personal injury law is primarily to ensure justice for the victim of an injury, not to punish or get money out of a defendant for no reason at all. If you still have moral concerns about filing a lawsuit, it will be better to address those concerns with your attorney and explain that you want to play fair and not use the law as a weapon. We hope that this article has been helpful in clarifying personal injury law and that many common myths about this area of law have been dispelled. If you have any questions about personal injury law or if you want to file a claim, please contact the Law Office of Yuriy Moshes to arrange a free consultation. We provide personal injury claims representation to all five on New York City’s boroughs (Manhattan, Brooklyn, the Bronx, Queens, and Staten Island) as well as Long Island, Northern New Jersey, and upstate New York. Have you ever had a bad experience with a personal injury attorney? Are there any other issues of personal injury law that you would like to see us clarify in the future? Please reach out to us with any comments that you may have.